It appeared that lightweight contender Michael Johnson’s hot streak was going to move to five in the UFC Fight Night co-main event against Beneil Dariush Saturday night, but two of the three judges disagreed, awarding Dariush a split decision that was greeted with boos by fans at the Bridgestone Arena in Nashville, Tennessee. Johnson’s in and out strategy served him well in the first round, and even though Dariush scored with his jab and some hard kicks to the lead leg of “The Menace,” Johnson’s ability to stuff his foe’s takedowns and score a flash knockdown with a left hand four minutes in allowed the St. Louis native to take the round. Dariush’s attempts to get the fight to the mat again fell short in round two, allowing Johnson to put together another solid five minutes of work, with the left hand again his primary weapon of choice. That doesn’t mean Dariush was uncompetitive standing, because he got in more than his share of shots, but he wasn’t able to put together enough strikes consistently to hurt Johnson or deter him from his game plan until the final stages of the third round, when he began mixing things up well and outworking his opponent, a late run that proved to be enough for the judges that awarded him the fight. 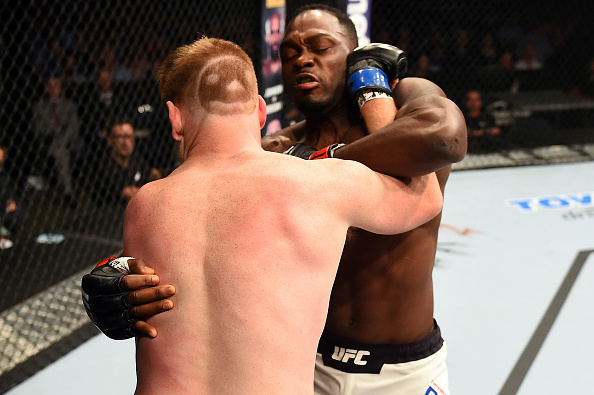 Rising middleweight star Derek Brunson made it three straight in the Octagon in dominant fashion, blitzing and beating Sam Alvey via first-round TKO. Brunson took the fight to Alvey from the outset, bulling his opponent into the fence, and there he did a good job with uppercuts and body shots. Eventually, he tagged Alvey and began unloading with wild haymakers. Alvey tried to recover and counter, but the relentless attack of the North Carolina product was too much, and once Alvey hit the deck, a couple more follow-up shots brought in referee Mario Yamasaki to call a halt to the bout 2:19 into the bout. With the win, the number 15-ranked Brunson ups his record to 14-3; Temecula’s Alvey, who saw a three-fight winning streak snapped, falls to 26-7 with 1 NC. Jared Rosholt held off a late charge from Tim Johnson in their heavyweight bout, winning a clear-cut, but uninspiring, three-round unanimous decision. Scores were 29-28 across the board for Rosholt, now 13-2; Johnson falls to 9-2. 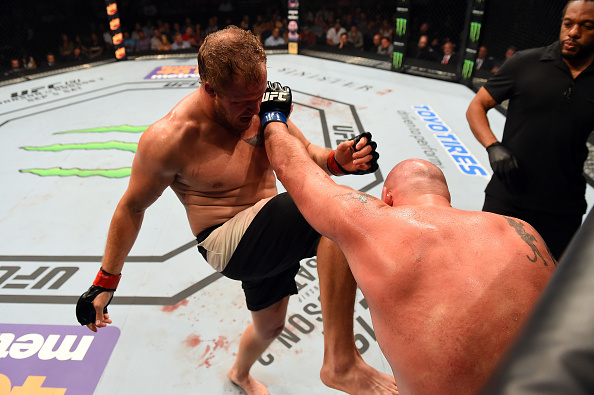 The first three minutes of the bout were characterized by stalled action against the fence, but with under two remaining, Rosholt came alive with a takedown and solid ground work to wrap up the round. Johnson picked things up as the second opened, briefly jarring Rosholt with a punch to the head before the Texan bulled him into the fence once more. Midway through the round, Johnson was able to turn the tables and get Rosholt to the mat, but his attempt to take his foe’s back came up empty, allowing Rosholt to get top position again, where he almost locked up Johnson’s arm before the end of the stanza. It wasn’t pretty, but Johnson was trying to finish in the last round as the gassed Rosholt was content to lock up and stall against the fence. With 30 seconds left, Johnson finally found enough daylight to rock his foe, but he decided to score a late takedown, effectively ending any chance of a late finish. 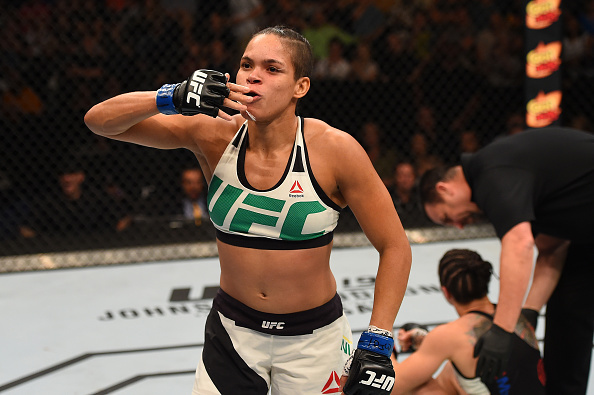 In a meeting of top ten bantamweights, Brazil’s Amanda Nunes delivered the most well-rounded and dominant performance of her UFC career, submitting Sara McMann in the first round. Nunes’ striking was on point from the start, and when she tossed aside the Olympic Silver medal-winning wrestler’s first takedown attempt, it was a bad sign for McMann. With less than three minutes left, a right hand rocked and dropped McMann, and after a barrage of ground strikes, Nunes took her opponent’s back and sunk in the rear naked choke that produced a tap out at 2:53 of the opening round. 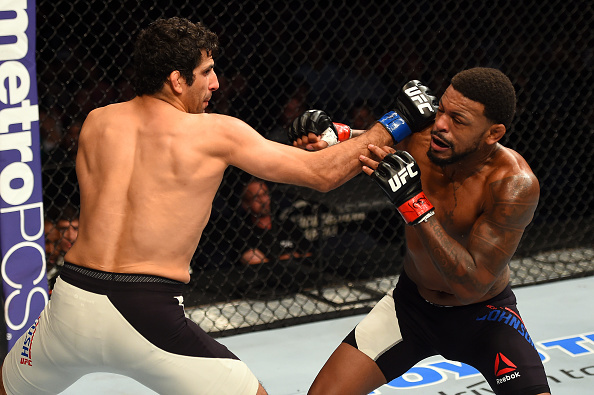 With the win, the number seven-ranked Nunes improves to 11-4; the number four-ranked McMann falls to 8-3. Octagon debutant Geane Herrera likely has a bright future in the UFC, but he ran into a flyweight buzzsaw in his first bout, as Ray Borg earned his third straight win via unanimous decision. “Demetrious Johnson, I’m not calling you out and you may not know who I am, but I don’t care if it takes me three fights, eight fights, if I lose one along the way, I’m coming for that belt and nothing is going to stop me,” Borg said, addressing the UFC flyweight champion. All three judges saw it 30-27. 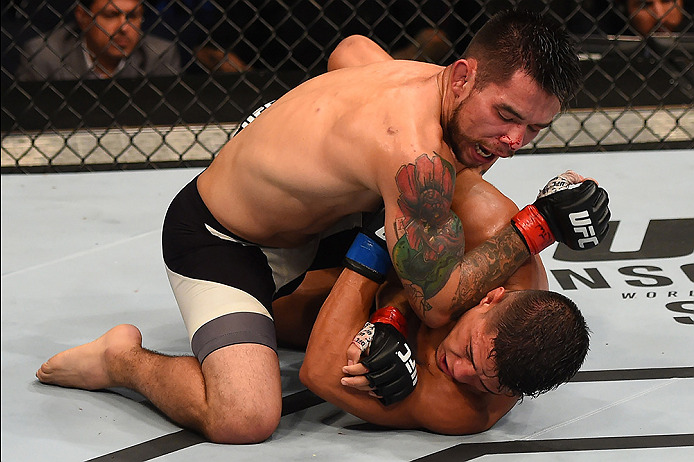 Borg got a takedown to start the fight, but the busy Herrera kept the New Mexico native from settling into position. Borg was eventually able to slow things down with a guillotine attempt that the Floridian eventually escaped from, and “La Pulga” sought out a heel hook before Borg took control again as he tried for a kimura. The scrambles continued throughout the round, Borg in control, but Herrera fighting back every step of the way. The fight went right back to the mat in round two, Borg on top and attacking, nearly finishing things with a guillotine choke. Herrera defended well and got loose, but he wasn’t getting the chance to lead against the relentless Borg, who dominated the frame. Borg didn’t let up in the third, even though Herrera was able to cut him around his left eye with a short elbow from the bottom. And while Herrera kept battling, sweeping and looking for submissions, Borg was never in serious danger. Borg, who came in overweight for the bout at 127 pounds, improves to 9-1; Herrera drops to 8-1.